On the day that the seven V065 race boats arrived in Newport, thousands of spectators turned to their digital devices to watch live race updates for a “pit lane” experience while others accessed the local network for race information or to share pictures or videos online. During past events in and around Newport, when Tom Guthlein, Operations Section Chief for the Rhode Island Emergency Management Agency, and his team shared the network with the public, emergency communication over the existing commercial network was mired by delayed or lost signals, often making his job difficult at best. In order to maintain the public’s safety and security at large scale events, Guthlein’s team must be in constant communication with each other and dozens of other public safety agencies on the scene. 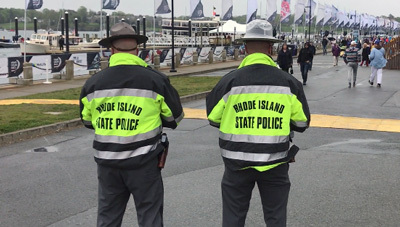 Instead of the usual frustration that plagued communications at past events, during this year’s sailing race, Gunthein and his team had a different experience when FirstNet outfitted area first responders with over 30 FirstNet devices. Fire, police, emergency management and EMS were connected to FirstNet’s Core with priority and preemption to enhance communications and coordinate response efforts. “When we tried the new technology that came out of FirstNet and applied it to this event, tracking public safety entities in the venue was great for situational awareness,” said Guthlein describing his experience using FirstNet-ready devices. Area first responders with FirstNet-ready radios had access to push-to-talk capabilities on their mobile devices and the ability to set up talk groups for one-to-one and group communication, allowing for a more coordinated response. During a boat mock-up before the race, FirstNet proved invaluable when an individual fell overboard. For the first time, Guthlein’s team had access to a network that could sustain location-based technology to pinpoint the exact locations of the mobile response teams and deploy the closest one to the scene. Key medical personnel also used FirstNet’s advanced technology to receive updates about the patient’s location and status every 30 seconds, allowing for a faster, well- coordinated response and overall better patient care. For information about communities across the nation subscribing to FirstNet services, check out our FirstNet in Action page.